Skyward Sword: Check Out Those Details! Today’s article is less an article, more a top list, but it highlights one of my personal favorite things Nintendo always tries to bring to their core franchises – loving care put into each and every detail. Now, I realize that little moments of nostalgia or “wow, that’s a neat little effect” do not a good game make, but at the same time I don’t think that makes them any less fun. Just from what I’ve seen of Skyward Sword so far – mostly from footage of people playing the demo since continuous live play reveals a lot more than the current “controls showcase” trailers can – I’ve picked up on a lot of fun little details that you might not have noticed. Take the logo above: the addition of vines may not seem like much, but it’s a deliberate throwback to the original logo which also was covered in vines. When we see the Master Sword flip over to reveal the game’s subtitle, its placement is also evocative of the first game where we see a sword inhabiting the same position. It’s something that not everyone will pick up on, but that for longtime fans will click instantly. See below for some more examples. This is probably one of the more obvious ones, but in case some of you didn’t notice – yes, enemies in this game will be disappearing in puffs of purple smoke when you defeat them. If you weren’t a fan of Wind Waker, on the surface this might turn you off, but look deeper: the smoke actually forms in the shape of a skull. Sure, I’ve seen some naysayers who think that this doesn’t make it much better, but looking back, the skull-shaped cloud of death-smoke isn’t new to the series – it first appeared in A Link to the Past. In Skyward Sword it’s taken on a somewhat new prominence, since rather than coming in a flash it lingers for a couple moments before dissipating. Really neat, really nostalgic. If you’ve followed much of my talk about difficulty in Zelda, you probably know that I’m not really a fan of the over-abundance of recovery hearts in the recent games, but there’s something about the way they’re being handed in Skyward Sword that makes me forget all that. 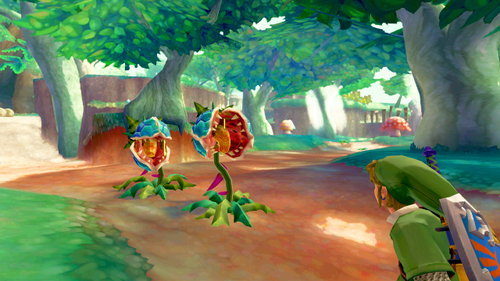 For one, you can still get hearts by the normal means – by killing enemies and cutting grass – but Nintendo’s also sort of worked them into the game world by including “heart flowers” where the heart is the plant’s bud. More in the hearts department: watching your heart meter deplete as you take hits is nothing new, but what about watching your hearts literally fly out of you? 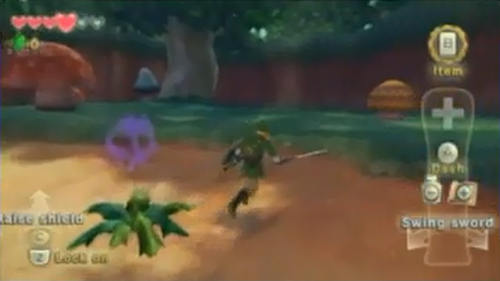 Every time Link takes damage, you can see a small heart tumble to the ground and disappear. Again, not a reflection on good gameplay by any means, but a reminder that even though this Zelda definitely won’t be in HD there’s still a lot of attention to small details. Zelda games haven’t typically been noted for impressive lighting effects, but there’s one particular piece I noted in the demo area that a lot of people have ignored – it’s the initial road leading into the demo area. The way the trees in this game look has gotten some certainly-deserved heat for the flat textures used to simulate leaves, but one thing you can’t deny is that the forest shadow effects used in this game look great. You can actually see the shadows of tree boughs swaying to and fro above you, making the world appear just a touch more organic. Maybe this isn’t as big a deal as I’d like to think it is, since I’m sure that for the HD twins this is standard practice, but it was something I wasn’t really expecting to see in a Wii game where realism is secondary to style and gameplay. This really pertains mostly to the Stalfos enemies, as we haven’t really seen any other in-depth enemy combat in action so far, but did you know that as you damage a Stalfos you’ll see its ribcage start to fracture and break? Having enemies take visible damage isn’t particularly new to the series, but it’s usually reserved for cases where such damage has a function in gameplay – for example, hacking through a Darknut’s armor will cause pieces of it to fall off, leaving it defenseless. 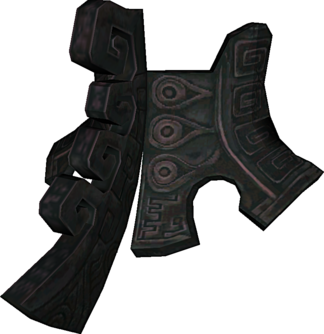 Of course, there’s also the famous example of Ganondorf’s cape in Ocarina of Time and Twilight Princess, which becomes more tattered as the fight drags on, but now we’re seeing the same principles applied to what will certainly be a much more common enemy. Will other enemies get a similar treatment? Neat Easter Egg? Or a Meaningful Reference Hidden in Plain Sight? Pretty neat, eh? Now, unfortunately we can’t quite give ourselves too much credit – this probably isn’t a subtle nod to our humble site. 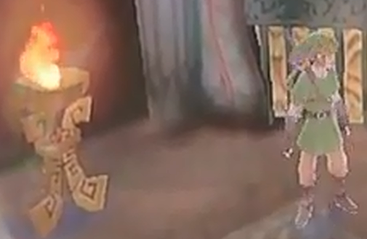 The symbol is actually originally native to the Zelda series, and comes from a very particular context that could potentially mean mounds for Skyward Sword in terms of story should its reuse actually constitute some kind of story connection. But I’d be depriving you dear readers of all the fun of unraveling the mystery for yourselves if I just came out and told you the symbol’s origins, so I’m going to leave you all with a challenge: where did this symbol first appear, and why might this mean something given its reappearance in Skyward Sword? Tell us your ideas in the comments section, and let’s see if someone can come up with the correct answer by the end of the day!